For our flights to and from Shanghai, we flew China Eastern Airlines. The only reason we chose this carrier, which is a member of the Sky Team alliance, is that their price was 60% of any other carrier’s – the Shanghai market seems to command unreasonably high air fares. The flight was fine, although the flight attendants are frumpily dressed and are surly in their attitude. They make the flight attendants at US airlines look cheerful. The thing I found particularly odd was how the meal service differed on the outbound and return flights. Our outbound flight left Bangkok at 2:00 am, arriving Shanghai at 7:00. I would have expected that there would be no meal service for this four-hour red eye flight but about an hour after our delayed departure, the flight attendants served a choice of hot entrees for a relatively substantial meal. This is the duck with wide rice noodles. Our return trip left Shanghai at about 9:40 pm, arriving Bangkok just before 1:00 am. 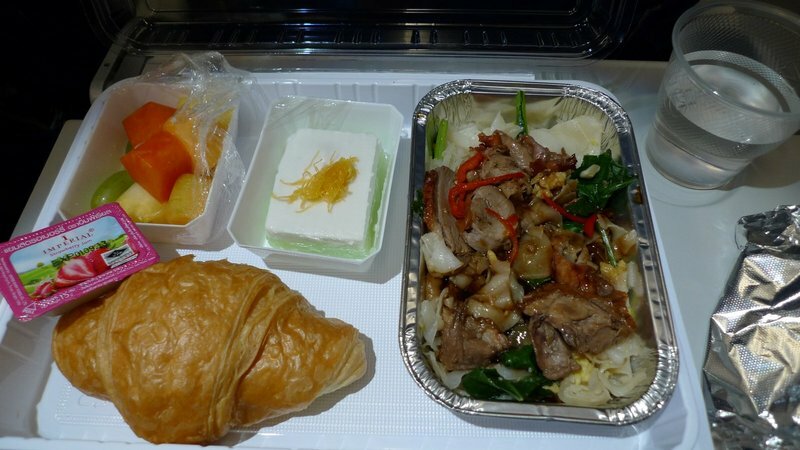 Considering that you need to arrive at the airport a few hours before departure, I expected they would serve a hot meal service, similar to what they unexpectedly served on the outbound flight. Instead, we were served a plastic box of snack items: dinner roll, slice of banana bread, hickory kernels, apple chips, onion cookies “with original flavour,” and what I think were Oreo-flavored cookie bars. In short, a very sad selection of food. In this day and age, I guess I shouldn’t have any expectations for food served in economy class anywhere in the world, but I was confused by the difference in service levels between the two flights on the same route. This entry was posted in Uncategorized and tagged airline, airplane, food, meal, snack by christao408. Bookmark the permalink. Ill take the first tray please.The second tray just looks like someone threw a bunch of stuff together because they ran out of the first tray. That is not a surprise to me! It’s a huge improvement from 6 years agoI was given a large space bag sealed picked veggie as snack and nothing else. Perhaps you should write a letter to the airline or point to your post. Very odd indeed. Odd color seats too. I just noticed how half is blue and the other half is red. I am surprised that airlines do not sell food on the plane (after all they have a captive audience/customer) Don’t they charge money for drinks?What about the movie or entertainment on the plane? I suppose in economy section you bring your own IPOD or other device to entertain yourself? The snack box baffles me. I’ve never seen that on a flight. Grumpy staff? tsk tsk… I wonder how well they are trained and compensated. @ElusiveWords – I’m curious about their compensation, too. In most Asian countries, being a flight attendant is a pretty well-paid job and one for which there is a lot of competition. These FAs didn’t look at all happy about their job. @Inciteful – Yes, I wasn’t sure what the heck they were. @mizz_chan – Oh, it is common on US carriers but is offered as a buy-on-board option. Usually, though, the selection is a bit more cohesive and not just randomly thrown together. @PPhilip – Depends on the airline. The budget carriers in Asia (Air Asia, Tiger Air, JetStar, etc.) all offer buy-on-board food. The full-service carriers still pride themselves in providing meals included in the price of the ticket. @awoolham – Since I generally fly Star Alliance carriers, it is unlikely I will be on this airline again. Not worth my effort to write a letter. @Wangium – Wow, you are kidding! Yes, this is an improvement then. @Texasjillcarmel – I love it more when I am expected stuff and actually get it! @CurryPuffy – Yes, I imagine I won’t fly them anytime soon either. @Fatcat723 – @beowulf222 – Why wasn’t it a surprise? @Devilzgaysianboi – That’s exactly what it looks like! so sad. consistency is not their main strength, i guess. 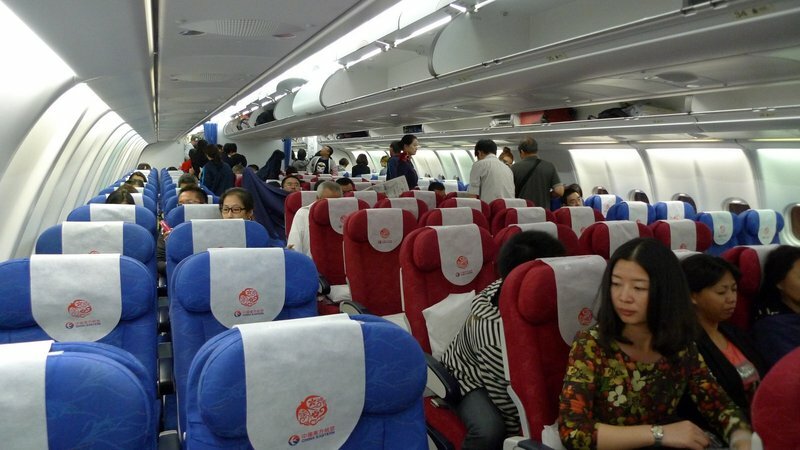 @christao408 – These (mainland) Chinese airlines have yet to build up the service culture. They are first domestic champions and cater to the local crowd. Abroad (for foreign passengers) their reputation is for being dirt cheap and people don’t expect much. Airlines like SQ or CX always wanted to stand out in terms of quality. That’s not the concept (yet) of CZ, CA, or MU. @beowulf222 – Ah, insightful analysis. Thanks for explaining, Nick. @christao408 – To add on, Chinese airlines (like other Chinese producers) have not developed a brand identity, and thus service is a bit unstructured and “weird”. 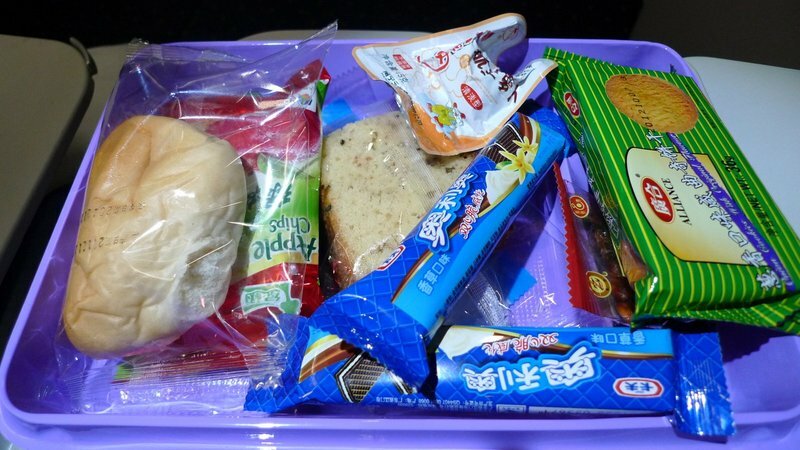 @agmhkg – No doubt it is – I’m just surprised that they didn’t do the snack box both ways!